Marathons or racing competition is generally about winning. Or so it has always seemed to most of us. But human beings, at least the kind ones, are capable of doing so much more than just winning – they are capable of setting aside the drive to make records and do something unexpected. That is what a runner, Khemjira Klongsanun from Bangkok did. When she had started the local marathon, she had her eyes straight. With her adrenaline pumping and her racing instincts on the high, she was looking forward to beating records. But while running something caught her eyes, and somehow, her focus changed then and there. 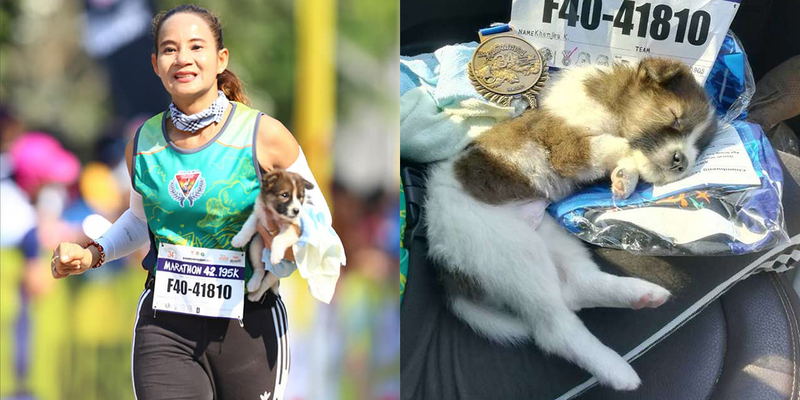 The local marathon was 26 miles long, but as Khemjira Klongsanun was reaching the 7 miles point, she spotted a tiny puppy lying on the roadside. There was no parent of the puppy in sight and so it didn’t take long for Khemjira to understand that the puppy was abandoned. She had no parents and no owner to look after her. Khemjira had two choices – either start running and forget that she had encountered such a sight or be kind to an abandoned animal. Records, while important, did not mean much for Khemjira. She put a hold on racing and took the helpless puppy into her arms. But that wasn’t all? She huddled the puppy in her arms and started the race yet again, dashing for the finish line. She ran with the puppy in her arms for the next 19 miles. The puppy knew it was in safe hands. It probably enjoyed the breeze too. There were numerous occasions for Khemjira to hand the puppy to a spectator and continue with the race burden-free. But she didn’t – she had retrieved the puppy and she somehow knew that the puppy trusted her. It was a bond that was formed immediately and she was not willing to break it at the moment. And she finally did what she had started – she dashed through the finish line with the puppy in her arms. Two of them won that day – but Khemjira won a lot more. She did not care about the race and how much time she had lost in the rescue mission. Her unusual racing companion became a family and Khemjira was not going to lose a family member. Khemjira decided to give the puppy a home and so, she drove it back to her house. The puppy took a long rest in her car. The puppy was given the name Nong Chom and was taken to a vet for a check-up. When everything was found out to be fine, she was brought back home. Nong Chom met all the other family dogs and she became one with them immediately. She is surrounded by care and love. Khemjira did try to get find any relation of Nong Chom, in case the small puppy needed a mother, aunt, or sibling. She went to the place from where the puppy was retrieved and searched for any other dog of a similar kind. There were none. When Nong Chom was picked up, she was truly alone. But now, she was home, with a loving mother, Khemjira. Her life has changed for the better – and now, she is living her best times. There are many stories of stray pets being saved by people, but this one was a brilliant story because it came with a sacrifice. It just shows that while there might be some sacrifices that we need to make in life, they may turn out to be for the best. 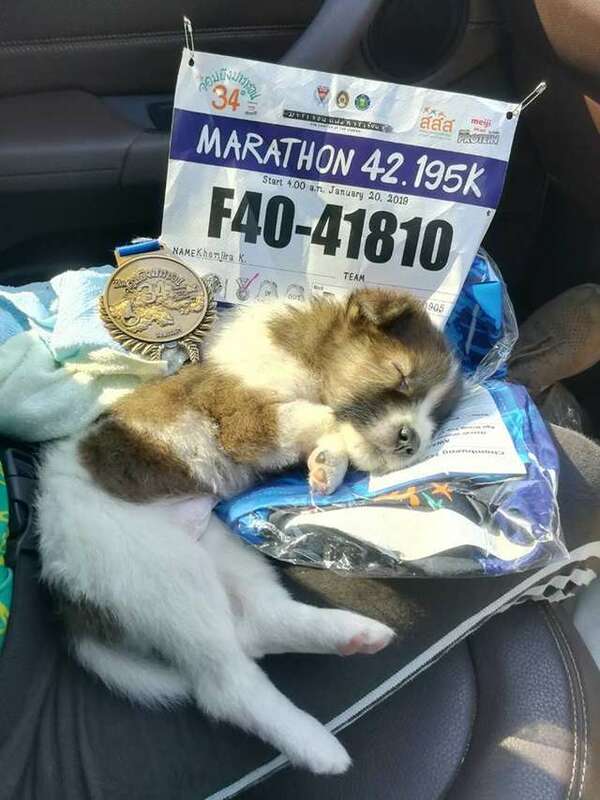 Khemjira is happy with the puppy she received – she doesn’t even remember how she might have lost the race back in the day of the marathon. It’s nothing compared to the loving companion she received that day.
? 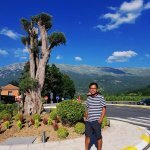 This Spanish City Banned Cars And Residents Say It Became “Paradise” These 11 Quotes By Elon Musk Will Inspire You To Achieve Greatness ?